At the JCYC, our Program Coordinator, Chef Sicily Sewell-Johnson shared her relationship to food and the community by teaching us how to cook grits and grillades. Sicily and her family embrace their African American roots, heritage, culture, family values, and family recipes in their cooking. By cooking recipes with the same authenticity of her ancestors and Southern comfort food, Chef Sicily perfectly embodies our theme of Food and the Community!! Sicily Sewell Johnson is a successful Executive Chef who graduated with the highest of honors from Le Cordon Bleu College of Culinary Arts. She has an extensive culinary background in Food Styling, Research and Development, Cooking Paleo, and in the food truck industry as she served as the Sous Chef on the hottest dessert food truck in Los Angeles. Sicily is one half of the dynamic duo of Pinky & Red’s, a mother- daughter food business under the La Cocina Entrepreneurs program where they make Southern comfort food into sandwiches. Chef Sicily’s great-great-great grandfather Roe Duncan, cooked as a slave for the Chapman Clearing family in Gallatin, Tennessee during the late 1800s until his death in the mid-1900s. Roe Duncan and his wife Alice handed down their family values, stories, and recipes to their daughter Annie Duncan Bush. Mama Annie understood the importance of owning and raising her own chickens, cows, pigs, and having a smoke-house in her backyard and tilling her own land for fruits and vegetables to ensure surviving rough times for her and her children as her parents taught her. Story has it that Mama Annie could go out into her backyard and grab a chicken, skin it, cook it on the old-wood-burning-stove like it was no one’s business. They would cook for white families, and then get on her horse called “Brownie” to go down the street and deliver a neighbor’s baby (the best mid-wife in town) – doing all of this before sundown. Mama Annie and her husband Papa Bud had 12 children and 8 of them were girls. Mama Annie passed down the recipes to her 8 girls, Emma one of the sisters had a restaurant in her home and another sister had a restaurant downtown years later. All the sisters worked in each of the restaurants. Sicily’s great grandmother Janie was one of the 8 girls and she handed those recipes down to her two daughters Anna Laura and Irene. Anna Laura was one of the few women who owned a tavern on 79th Street on the South side of Chicago in the 60’s with a full liquor license. Her sister Irene (Sicily’s grandmother) cooked and sold soulful dinners in the evenings and on the weekends. Irene handed the recipes down to her two daughters. Dionne is a Chef in her hometown of Chicago, Illinois and Bernadine (Sicily’s mother) is a Chef in San Francisco. Sicily and her mother Bernadine are now entrusted with the family’s legacy and we are committed to preserving and passing on those same soulful dishes that our ancestors cherished, protected and served for over 100 years. Boil 1 cup grits to 2 cups water. Stir until creamy and smooth. Add one 28 ounce can of diced tomatoes and let simmer for approx 15 minutes until reduce by 1/4 the amount and coats the back of the spoon. 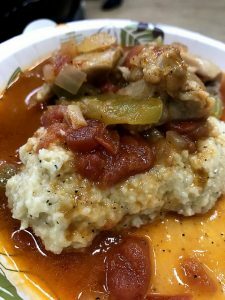 When grits are creamy and sauce is reduced, spoon hot grits in a bowl and top with tomato-trinity sauce. Garnish with cheese and/or top with meat.